Our mission is to create Chicago’s first interactive public art platform. In the heart of Chicago’s loop, on a piece of iconic infrastructure, we are building a place where art and technology come together in a canvas of light to foster public discourse and personal expression. We are installing a full block of programmable LED lights on the underside of the Wabash el tracks. You can connect the lights to movements and sounds like your heartbeat, the tap of a drum, or to the rhythm of your favorite song. The result will be a canvas of light for any person, anywhere, to use as a vehicle for expression. Our long-term goal is to install lights along the entire Wabash stretch of track from Lake to Van Buren. Phase One plans include over 20,000 total feet of lights along a two block stretch from Madison to Adams. Weavers use thread to narrate their history and experiences in a visual language. We use light to give voice to yours. Better yet, we’ll give you the tools to speak for yourself. In partnership with DePaul’s school of computing and design, we’ve developed a set of interactive functionalities that enable to public to communicate with the lights. Text the lights a color, or play an interactive game of “Simon” with them. Don’t like the curated light show above? Interrupt it. Whoever’s voice is loudest up above, you have the power to trump it. We are the city of broad shoulders, cruel winters, and unparalleled summers. But our city's greatest asset is its communities. 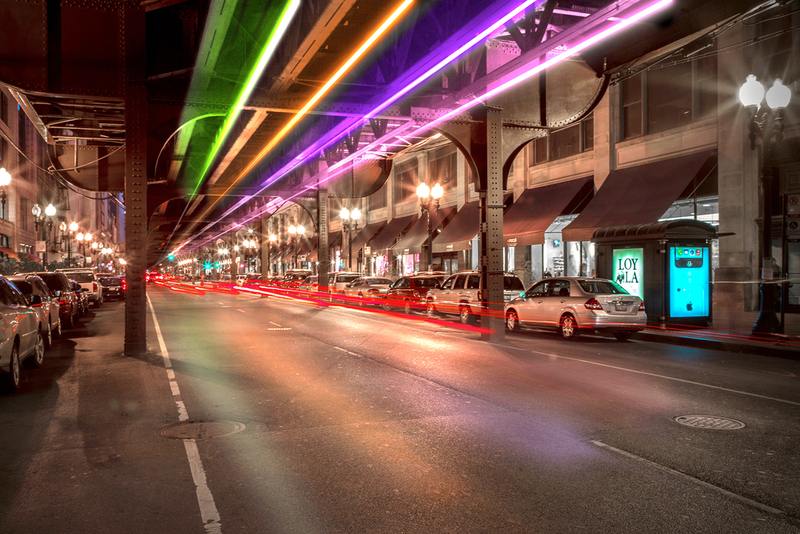 That’s why we’re inviting local artists to curate interactive lighting experiences on The Wabash Lights. Our role is to provide the tools and a vehicle for their expression. Their job is to share their vision of what we might become at our best, a mirror of who we are at our worst, or a snapshot of the small moments that make up our days. We cannot anticipate the immersive experiences these artists will design, but we are excited to come along for the ride. Through the generous support of our partners at Comcast, TableXI and DePaul University, we’ve made two mobile light demos. We are developing STEAM (STEM + Arts) curriculum to take the mobile lights demos into classrooms and conduct a series of workshops aligned with Illinois State Learning Standards. In the first workshops, students use the lights to evaluate competing design frameworks and develop a light show or installation. In subsequent workshops, students can connect their designs to the mobile light stations and see their voices, movement, or instruments represented in light. Want to support our STEAM programming, or have the Wabash Lights at your school? Get in touch.